As curators of our own paraphernalia and set designers of our own homes, each of us makes creative decisions that transform our living space and provide insights into our lives. The objects in our homes sometimes display the fulfillment of a certain dream of possession. Other times they enter our lives accidentally and are arranged haphazardly. Quite often their value is sentimental. What our belongings have in common is their capacity to represent (or disguise) the experiences, tastes, relationships, and desires that constitute who we are. 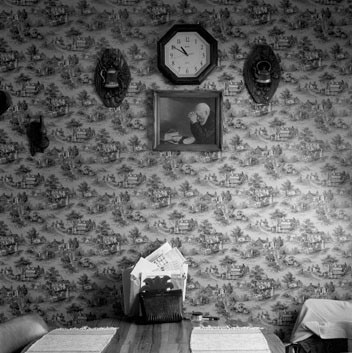 The photographs of Susan Carr and Jessica Rowe depict homes whose contents signal that they were established decades ago. 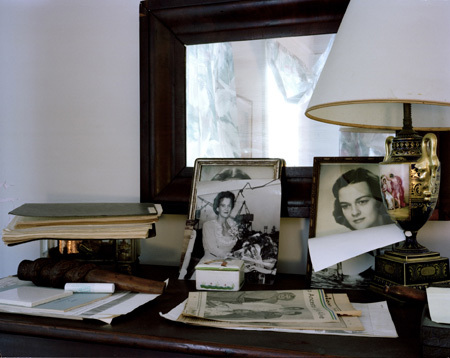 After years of accumulation, the assortment of objects is diverse—plastic plants mirror floral patterns on heavy drapery and faded wall paper; layers of photographs, books, and papers pile up on shelves like geological strata marking the passage of time. Some objects are chipped, faded, or broken, preserved for their nostalgic value in spite of their blemishes. Many make visible our changing notions of “taste” and might be classified as kitsch, a term that is often used to describe mass-produced art or artifacts that appropriate “high” art strategies in the service of garish or sentimental themes. Of course a bouquet of plastic roses surrounded by a ceramic deer family is only kitsch to those of us whose view it from a mediated, critical distance. 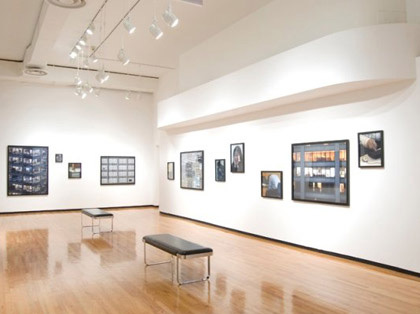 Carr’s and Rowe’s photographs, like all photographs, are tangible manifestations of a mediated gaze, and therefore encourage a critical reading of these objects. Yet at the same time the careful aesthetic attention the photographers pay to these scenes incorporates this kitschy subject matter into the realm of “high” art. Ultimately Carr’s and Rowe’s photographs highlight the fact that kitsch is a relative term that assumes a dominant culture against a lesser subculture. Publicly shared conventions, rules and practices that deem something “art” are suddenly not as decided as they may seem. This exhibition and related programs are sponsored in part by OnRequest Images, the Illinois Arts Council, a state agency;Mayer & Morris Kaplan Family Foundation; the City of Chicago Department of Cultural Affairs/Gallery 37; LG electronics, Chicago and American Airlines, the official airlines of the Museum of Contemporary Photography, and our members.